Three plus weeks after the event and I can’t stop thinking about it so I thought I’d get a few things down in B&W and submit a rare blog post just before entries open for next year. 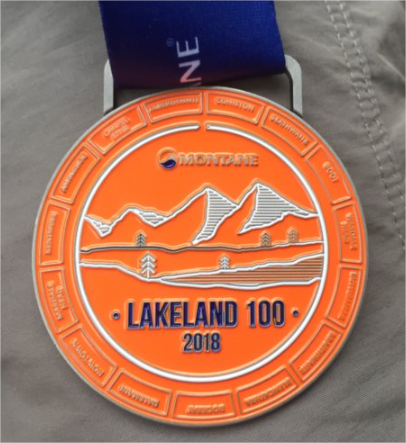 The Lakeland 100 and the Lakeland 50 take place at the end of July with the 100 setting off from Coniston and doing a 105 mile loop (it’s not 100) via Boot, Wasdale Head, Buttermere, Dockray, Dalemain, Howtown, Kentmere, Ambleside, Tilberthwaite until finally arriving back at Coniston. The 100 starts on Friday night at 6pm and you get 40 hours. The 50 starts at Dalemain (up near Pooley Bridge) at 11:30am on the Saturday and you get 24 hours. The 50 has around 3,000m of climb and the 100 has around 6,900m. I’ve done the 50 six times now and fancied the 100 initially around 2014 when I did one of the recce runs with Mark Willett and Steve Cartmell to see what it was like. After that 1st recce I vowed I would never do it – the first quarter Coniston to Buttermere is rough with Walna Scar, Black Sail Pass and Scarth Gap to get over plus you’d be in the dark for most of it. After watching a couple more 100 starts and having a great 50 last year (with a few other Red Rosers) I just decided to do the 100 and get it done. I entered the 100 and that was it. No turning back. •	The start is awesome. I had loads of support from my wonderful wife and daughter as ever but also a lot of Red Rosers and the sight of my good pal Mark and Jacob Willett starting the run was very special. Stingy eyes. The run through and out of Coniston is lined with cheering crowds and all the way up to Walnar Scar car park people are out. It was boiling but very memorable and a great start. •	Coming down to Black Sail Hut and then over Scarth Gap around midnight I listened to Pink Floyd’s Shine On You Crazy Diamond and it was perfect. •	Panic when I thought I’d lost my spare batteries at Buttermere – complete unpack, rifle through like crazy, panic and then found them. 10 minutes wasted. •	Falling, twisting my ankle and hearing a crack on the grassy descent into Braithwaite. Concentration wrecked. Decided to just walk in to the checkpoint. •	The baby crying in the only house with lights on as we crept through Braithwaite at around 4:30am. •	Rice pudding and ankle rotations at Braithwaite. •	Seeing everyone at Dalemain and getting changed into fresh gear. I felt great and the worst was over (ish). Having done the 50, the next X hours are familiar territory. •	The highest winds and horizontal rain going up Fusedale which made me pray to my Mum. I decided that once on the top I’d better get down as soon as possible. This probably snapped me out of just walking the rest of the route (30 miles to go is a long walk). Nice to chat to Mark McCrae (Mad Dog) on the way down to the reservoir path. •	The echoing clap of thunder at Mardale head which reverberated around the valley and the 10 seconds of hail which followed. •	Everyone at Ambleside (Wendy McNair plus points). Ambleside is always a boost. •	Legging it down the road after the drop into Coniston down the rough old Miners’ Road. 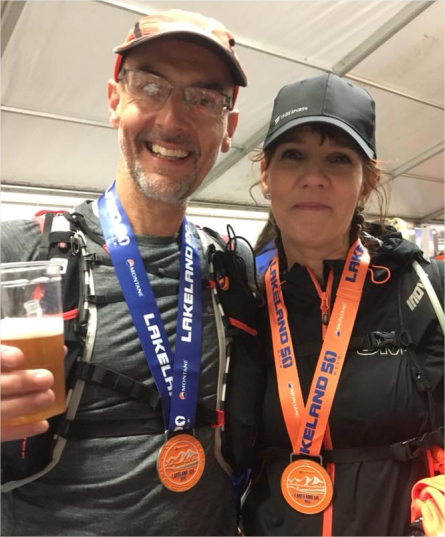 Seeing Jackie and Jess at the finish and then everyone in the marquee as I got my medal off Gareth Bell who got up to see me and Pita in. •	Feeling great at the end. A lot of positives based around a successful 32 hours, 13 minutes and 13 seconds and a final Garmin mileage of 106.66 miles. Out of 419 starters, 215 finished (5 were out of time though); 51% completion rate. I knew what I was in for. I knew the course from the reccies so no surprises apart from the weather. If you don’t know Coniston to Dockray and see it for the first time in the event you’ll just feel beaten up. Run for a cause (#jacobsjoin) and tell loads of people you’re doing it – these are the other voices in your head and you will think of them in your dark moments. I had a realistic aim of just finishing it. Anything else became a firmer aim as I ticked off the miles. I know to just take it 1 checkpoint at a time. The longest stint is 11 miles. I’d done (and not enjoyed) the 10 Peaks, 5 weeks before. This was over, craggy, sharp scrambling tops and I knew the L100 wasn’t as rough as that. Above 600m the Lakes gets craggy and most of the L100 is below this – still rough but not boulder fields. I’d retired after 30 miles from the 10 Peaks which I wasn’t fussed about but I had to see the 100 through to the end. 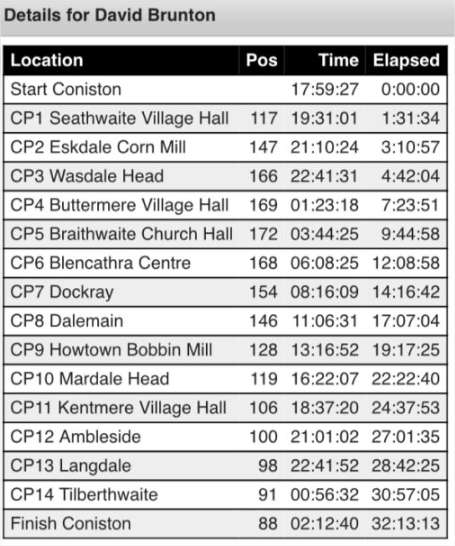 My training was 900 miles up to the event which was the same as last year surprisingly across the same number of runs. However, because of the ice and bad start to the year this was pushed later in the year – same miles in less months, nearer the event. Climbing and hills were up significantly by 2,900m and a lot of this happened in the last couple of months before the race with The 10 Peaks counting for a lot. Less road running – pointless for this type of event though I did stick to a 30 mile per week goal. I did a couple of recces, Caton Moor Fell, Howgills Trail marathon, Bolton Hill Marathon, Cuerden Valley and Beacon Fell (with a rucksack carrying around 2kg), Arnside Knott in the heat and really slow steep hills on holiday. The riverside farmland to the Dolphin was a regular too as the hot weather made the cattle trodden ground a good hard uneven surface. You’re not after speed but tolerance and rubber ankles. Core exercises were a bigger focus this year. General press ups and planks a few times a week and then in the last 4 weeks full body and core sessions using an app called ‘Sworkit’ – the 20 minute sessions are tough. All the core work is meant to help your back on the hills and your overall posture as you fatigue and I think it worked. A good drop bag helped at 60 miles at Dalemain. Toothbrush, flannel, dry socks, change of shoes shirt and cap. I spent a good few minutes just letting my feet dry out and cleaning them of grit and mud. No blisters at all. I stopped whenever something seemed like an issue and just sorted it there and then. The temptation is to notice a small stone in your shoe and tell yourself you’ll sort it in a minute but you don’t and then it shreds your foot to pieces. I avoided sugar and cola from an early stage. A lot of the stomach issues people have seem to blame gels, and sugary drinks. If you are dehydrated (and in an ultra you run in a state of semi dehydration), sugary foods and drinks will just draw out more water from your body to your stomach. I prefer water, tea and coffee and slow burn bland foods such as peanuts and sandwiches with a few jelly babies. Use the checkpoints to get yourself straight: at Kentmere (89 miles in) I was wet and cold so I used the time to swap kit, drink tea and hot food and get a dry buff and gloves and hand warmers ready for setting off. Stopped me getting even colder and ending up in a foil blanket at the next checkpoint. Finally, I walked a lot but at a decent pace. It’s a foot race not a continuous run. That’s it really. I’m thinking of it every day at the moment even down to the detail of what the hell Shane Cliffe was telling me at the finish (no idea – but he had a great run). 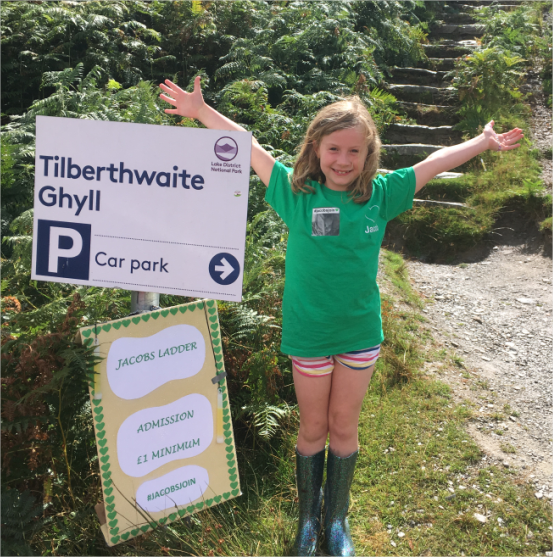 Along the way #jacobsjoin was an important mini fundraiser for me and is still there – https://www.justgiving.com/crowdfunding/davel100?utm_term=X8p2erB2v The Tilberthwaite checkpoint raised £1,400 over the weekend and Jess and Jak with Charles and Angela Colby were a welcome sight before the windy and windy push to the finish. 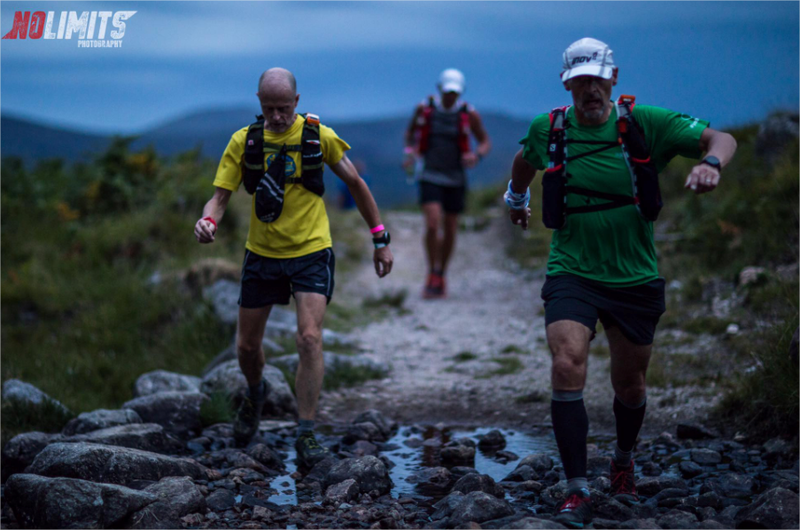 If you fancy the 50 go for it – it’s a massive achievement and tough. Entries open on 1st September at 9am at www.lakeland100.com. If you fancy the 100 you could still go for it but know what you’re in for – it’s good to scare yourself sometimes but even better to come out the other side smiling. Really interesting read Dave…thanks for sharing! 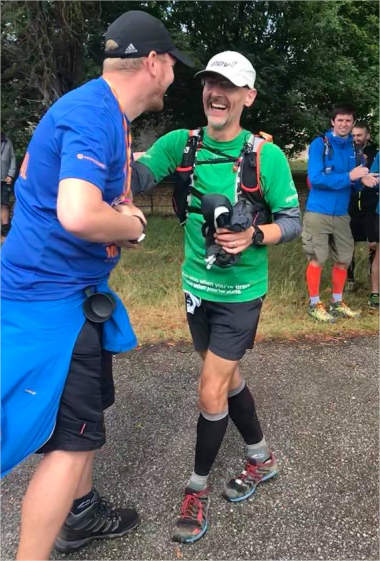 It was great to see you looking so well at the Ambleside checkpoint.